A miraculous thing happened last week, I had lunch. Not only that, I had lunch outside the shop! Jen came by and took me out for a bite to eat at The Beaver. I’ve been dying to try the food there and it did not disappoint. We both had salads. That seems really ‘girlie cliche’, but I really just needed some greens. I don’t get enough with all the pie and cake and cannolis that I eat. 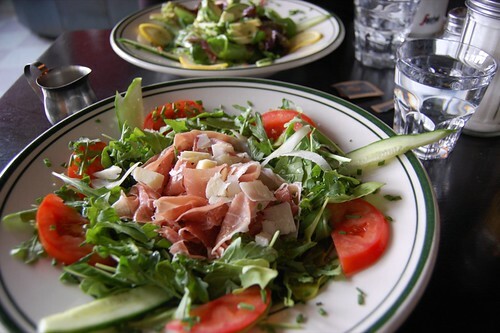 I had the prosciutto salad and Jen had the smoked salmon salad. Yummy. Also, Jen always has THE best earrings. It’s jealousy-making. For my fellow Gossip Girl pals, please check out this hilarious article in New York magazine…I haven’t even seen the episode they’re talking about, but I LOVE the assignment of points for every little detail and the +240 comments that follow. Also, reading the comments I discovered the I Am Chuck Bass blog. AND the Chuck Bass Womanizer commercial. That should keep you busy for a while! 13 DRESSES : DRESS 13! Whew, glad to know that there is someone else equally obsessed with Gossip Girl out there. I love the clothes, the cattiness and of course, the beloved Chuck Bass. darn you karyn, for introducing me to all that on-line Chuck Bass. I have a job you know. That Daily Intel blog is a real time sucker. Why must I have a job? The pictures of Ed Westwick (Chuck Bass) making out with Drew Barrymore in some bar are fun, as are pix of Chace Crawford (nate) out on the town with Drew Barrymore and Ellen Page. Oh dear. Daily Intel keeps referencing itself in previous forms and linking to other pages! I shall never have time to work again! mb – oh lucky you! did you see any of the cast? kirsten – i decided to come out of the gossip closet a few months ago. it’s such a relief to share the love! jill & charlotte – i wish i could calculate the hours of blog surfing i did at my previous job. it was probably 90% surfing, 10% work. it was the only thing that kept me going. i love drew. what a lucky lady macking on the GG boys! you are nuts! i can’t believe you made all those dresses. and as for your mistake/feature train of thought, it reminds me of bob ross’ happy accidents from the joy of painting. hey, i’m in new york! let me know if you need anything special acquired for you – but no food. i won’t be home yet for three weeks. becky – i’m going to have to check out the joy of painting. i don’t know it. the only thing special i would like is a visit from you when you come home!